We've reached the end of our fiber journey through time. I hope I've been able to show how deeply woven, pun intended, fiber is in our lives and has been for millennia. We've seen how far back the human use of fiber goes and how important it has been for our survival as a species. We've learned about fiber goddesses from many different cultures and hopefully you've seen the similarities between them. I'd love to answer any questions you may have or hear any comments you have regarding the class. As I've mentioned before, I'm currently working on a book based on this course. It will include 20 knitting patterns I've designed which are inspired by the goddesses we've discussed and will use different fibers and techniques. As a special treat, I've included one of those patterns from the book in this final lesson. It has only been tested on me so if you choose to try it out, you'll be testing it for me and I'd love to hear your comments and suggestions. Enjoy! This hooded scarf could have been worn by Habetrot herself. Super soft baby alpaca yarn with an x and o motif around the face, a deep rib on the scarf ends and a simple heel style hood make this a perfect piece for cozy warmth. Need to know how to cast on, knit, purl, cable, do basic increases and decreases. 5 stitches per inch on size US 9 16 " circular needles. Gauge is not necessary for this project. Cable knitting, increasing with M1L and M1R, decreasing with SSK and K2tog. CO 36 stitches (RS) Knit 2, Purl 2 to the end of the row. Turn work. Continue in this K2 P2 rib until the piece measures 18 inches from cast on edge. End on a WS row. Repeat rows 17-32 four more times. Total increase of 80 stitches so 116 stitches now on needles. Repeat rows 33-48 four more times. 80 stitches have been removed/decreased, 36 stitches remain. Work in 2x2 rib as in the beginning for 18 inches. Bind off all stitches loosely. Weave in ends. Block. C4B- Cable 4 Back, slip two stitches onto the cable needle and move to the back. Knit two stitches then knit the stitches from the cable needle. C4F- Cable 4 Front, slip two stitches onto the cable needle and hold in the front. Knit two stitches then knit the two stitches on the cable needle. Knitting is the art of taking thread or yarn and making it into fabric. Two needles, or even sticks are used to produce this fabric with a series of loops made with the yarn. Unlike weaving, it does not require much equipment and can even be done on the move. I myself have walked miles while knitting. The earliest archaeological evidence of knitted-type fabric thus far is socks and stockings. Below is a picture of such socks. They are made with a technique called Nalebinding which uses one needle and a series of loops. It is unlike crochet because it involves passing the yarn all the way through each loop. This method is also unlike true knitting because it creates a set of fabric pieces which then need to be sewn together. It is easy to mistake these for knitted pieces. Most histories of knitting place the origins of knitted fabric in the Middle East, most likely Egypt sometime prior to the 11th century BC. 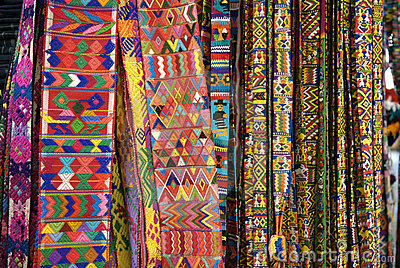 From the Middle East, these fabrics, and the technique to make them, spread out to Asia and Europe and then on to the Americas. The first knitting needles were likely made from wood or bone. Metal developed in the Middle East during the Bronze Age, well before we have evidence of knitting. But that does not mean metal was not used for making needles. However, the cost of metal would have been much higher than the use of wood or bone which would have been more readily available. Collection of spinning, weaving and knitting artifacts from the Roman site, Verulamium near St. Albans. 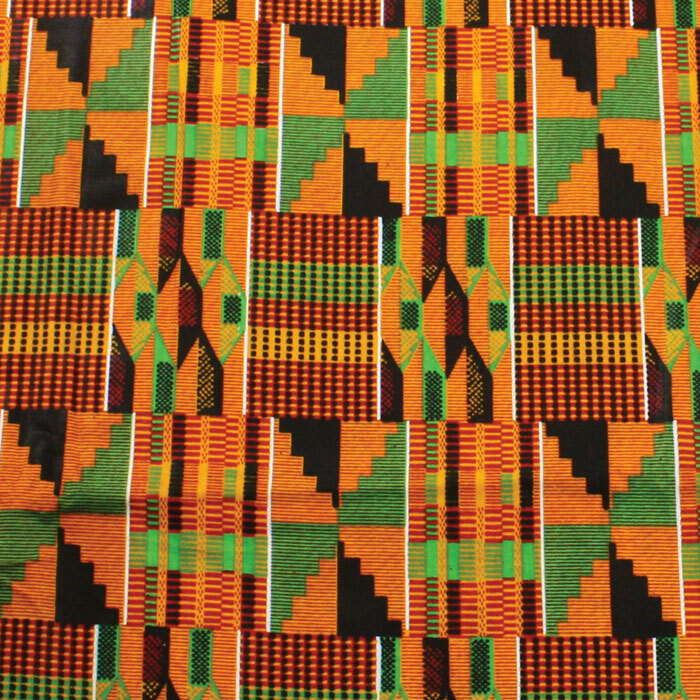 Many of these early knitted pieces were not monochrome but made of many vibrant colors. In the tombs of the Abbey of Santa Maria la Real de la Huelgas, a number of beautifully knitted items such as cushion covers and gloves were found revealing work as fine as 20 stitches per inch. The Abbey of Santa Maria la Real de la Huelgas. At this time, the purl stitch was unknown. The knit stitch was used in the round with multiple needles to produce a stockinette stitch. The purl stitch appears on the scene in the mid-16th century in the red silk stockings of Eleanora de Toldeo, wife of Cosimo Medici. She was buried in these and they include the first evidence of lacy patterns made with yarn overs. Red silk stocking buried with Eleanor de Toledo. The first knitting guild was set up in 620 AD in France. Men were the only ones knitting at this time (for profit at least). One must apprentice for six years first in order to become a member of the guild. During Elizabethan times, knitted stockings, usually of wool, became a sought after item. Knitting guilds were set up in England to train the poor and provide a way to generate income. Men were among the first to attend these training schools and set up shop as knitters for hire. Stockings began being shipped to the Netherlands and other parts of Europe. In Scotland, knitting became such an important occupation in the 17th and 18th centuries that entire families would knit up sweaters, stockings, socks, and other accessories for sale. These items were particularly popular with fishermen. The Faire Isle Technique was developed at this time to add very particular character to the pieces. Modern sweaters knit in the Faire Isle style. With the industrial revolution came machine knitting. The first machine knitter was actually developed in 1589 by an Englishman named Rev. William Leed. His wife still knitted by hand but his machine did revolutionize the industry over time. Men would operate the machines and women would hand knit the finishing touches. Elaborate designs such as cabling, lace work and color work further evolved up through the early 20th century. In the 1920s knitwear became a very popular fashion staple in much of the Western World. Even designers such as Coco Chanel embraced the trend. 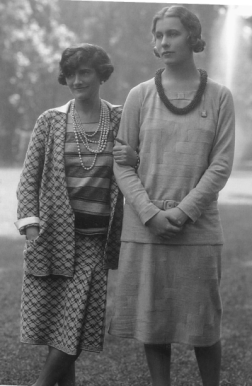 Coco Chanel with Lady Abdy, May 1929. During both world wars knitting was very popular. It was a way to contribute to the war efforts. Knitting remained popular up through the 1970s, both machine made and hand knit. In the 1980s, fashion trends changed dramatically with the more widespread use of synthetic fabrics like nylon, dacron and spandex. In the early 2000s, knitting began an upsurge in popularity along with a desire of knitters to learn more about not only the techniques of knitting but the fibers their yarns were spun from. Many books have been written on fibers from different animals and types of sheep, their properties and which fibers are best for which types of projects. Today it is a very popular hobby and the revival of a love of hand knit items has lead to a whole new cottage industry in places such as markets, festivals and fairs and of course online in places like Ravelry and etsy. 1. It arose in Arabia and followed the trade routes to Tibet, Spain and then the Mediterranean region. 2. It began with a South American tribe who used it in part of their puberty rituals. 3. It began in China, where there are examples of three dimensional dolls made with crochet. Sounds like ancient amigurumi. The earliest crochet patterns known to date were printed in 1824 and were for purses made with very fine gold and silver thread. "A Living Mystery, the International Art & History of Crochet,"
In our final installment, you'll get a bonus pattern from the upcoming book. This pattern is great for beginning knitters with no tricky stitches or patterns to follow and like the nomad knitters of old, are easy enough that you can walk your favorite forest path while you knit them up. Once fiber was spun, the next logical step was weaving. Weaving is the technique of taking two threads or yarns and interlacing them at right angles to form a fabric. The vertical threads are called the warp and the horizontal ones are called the weft. The way the warp and the weft interlace is called the weave. Humans have woven and continue to weave, all kinds of materials for all kinds of purposes. Woven thatch makes a great roof for a structure, woven reeds make great baskets and can even be made waterproof. But it is woven fibers made for clothing which we are really interested in here. There is some evidence weaving may go all the way back to the Paleolithic Era (some 2.6 million years ago to around 10,000 years ago). There have been indistinct textile impressions found at the Dolní Věstonice site in modern day Czech Republic. This site dates to around 26,000 years ago. Artist rendition of burial of three youths at Dolni Věstonice. This site has yielded a wealth of artifacts from the Gravettian period (roughtly 29,000-22,000 years ago). Numerous clay objects, including clay floors have been found which have woven fabric impressions on them. These may have been made from baskets, woven mats for sitting, or even some form of clothing. In 2013, a piece of cloth woven from hemp was found at the site of Çatalhöyük and dated to around 9000 years ago. Another fragment of cloth was found at the site of Fayum dating to around 7,000 year ago. We do not know the exact point of origin or the direction of travel of this technology. It just seems to have been in nearly every early civilization around the same time. We do know that slaves, usually women and children, were the likely weavers. In Medieval Europe the trade of woven cloth was an important part of the economy. The availability of thread or yarn was ever the factor that limited the output of the weaver. During the Middle Ages, the spindle was replaced by the Great Wheel, and thus more thread and yarn became available to weavers, increasing their outputs and availability in the marketplace. The word "loom" comes from an Old English word "geloma" which means tool or machine. There are many different kinds of non-mechanized looms still in use around the world today: back strap looms, pit looms, pegged looms, draw looms, warp-weighted looms, and hand looms, to name a few. Keren woman in Northern Thailand weaving with a back strap loom. Indian woman using a pit loom. Photo credit to Ganga Studio blog. Edmund Cartwright built and then patented a power (or mechanized) loom in 1785 building on the improvement of John Kay's 1733 Flying Shuttle. Kay's Flying Shuttle allowed the weaver to not only work faster, but to weave a wider than arms length piece of fabric. Loom technology continued to advance until the first appearance of the modern industrial loom in 1942. Modern industrial looms can weave 2000 weft insertions per minute! If you think back to what we learned about some of the weaving goddesses you can understand why they were so important to each culture. Knitting, which will discuss in the next lesson, while the perfect technology for some things, was not efficient for producing yardages of cloth to make clothing. Weaving is what helped us clothe ourselves. 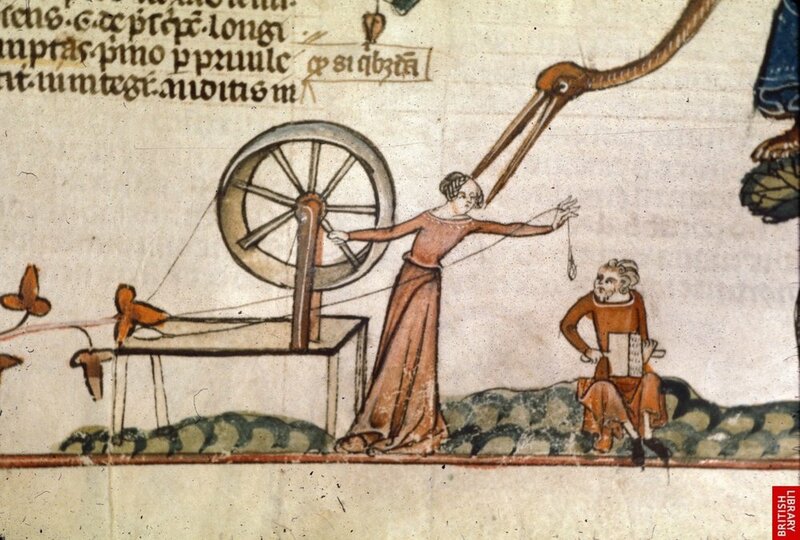 The earliest evidence for spinning wheels begins in the Thirteenth Century. We see early wheels in Baghdad in a drawing dated to 1237, China around 1270 and Europe around 1280. You can imagine how the trade routes carried this technology based on those dates. The earliest recorded wheel is of the Charkha variety. This is also sometimes called a floor spindle. The fiber is held in one hand and the wheel is turned with the other. The spinner must stop to wind lengths of the resulting yarn onto the spindle as they work. This type of wheel was perfect for short staple fibers, especially cotton, and was portable as well. Even Mahatma Ghandi spun on one and actually revived the method during his time. Ghandi spinning on his Charkha. Photo wikimedia commons. Around the same time as the emergence of the charkha we begin to see the Great Wheel, or Walking Wheel, where, like the charkha, the fiber was held in the left hand and the wheel was slowly rotated with the right hand. The fiber had to be held at a specific angle to the spindle in order to produce the right amount of twist. This type of wheel made very fluffy, long drawn yarns. These were not very good yarns for weaving as they weren't strong and smooth enough for the weft. This wheel was good for short staple wool and cotton that needed a long draw. These wheels are very large, often over 5 feet high. A citizen of Brunswick is credited with adding a treadle to the wheel in 1533. This allowed the spinner to use their foot to manipulate the spinning of the wheel and allowed both hands to draw the fiber. This flexibility lead to different draw methods as well as different qualities in the yarns produced. The Saxon or Saxony wheel was introduced in Europe in the 16th century and incorporated a bobbin on which the spun yarn was woven. Bobbins actually first appear in the notes of Leonardo da Vinci in 1490 and then gained widespread favor and use in the early 1500s. Fly wheels seem to have appeared first in Germany around 1475 and seem to have been used in flax processing. As time went on, the demand for spun yarns and woven fabrics was dramatically increasing and it took three spinners to keep up with one weaver. Thus, in 1764, James Hargreaves invented an improved spinning jenny which was the first hand propelled multiple spinning machine that improved on the previous wheels. Woman using the spinning jenny in a factory. As the Industrial Revolution exploded, the technology of the Spinning Jenny expanded as well and larger and larger machines were used to spin greater amounts of fiber at a faster pace. Spinning on a spindle or a wheel became something that was no longer necessary for survival in most of Europe and America. It wasn't until the late 1960s and early 1970s that these "craft" or "cottage" industries became interesting again. As movements such as homesteading, back to the land and survival prepping grew, people wanted to learn how to spin, weave and knit again. And as we know, it's a huge industry again. So what do we do with all this thread and yarn? Firstly, we wove it. We'll learn about that in the next lesson. In our second Origins lesson you read that for the past 9000 years or so, spindles of some form or other have been used. Spindles and spindle whorls have been found in archaeological sites all over the world. The spindle whorls tend to preserve better as they are usually made of stone, ceramic or shell, materials more permanent than wood which usually makes up the spindle staffs. When you think about it, it's a very simple tool. It's portable and very adaptable to the fiber being used. It's revolutionary and allowed a larger production of fiber than the method of rolling down the thigh, with less wear and tear on the palm and the thigh. So let's look at our humble spindle. There are two types of spindles we will discuss here; supported and suspended or drop-spindles. Supported spindles are used in a way in which the fiber and the yarn being spun, does not support the weight of the spindle. Suspended or drop spindles are hung from the yarn in which you are spinning. I've included some photos below of both. Two top whorl drop spindles. Supported spindles. Navajo spindle with cop. Not surprisingly, much of the archaeological evidence we have regarding spindles indicates that supported spindles evolved predominantly where the materials available for creating threads and yarns were short stapled (meaning the length of each fiber is shorter rather than longer, say under 4 inches or so), such as Africa (where cotton has long been produced) and many areas in Asia where livestock produce short downy fibers. As you might expect, suspended spindles are more commonly found in areas where longer staple fibers have been traditional such as sheep's wool or flax. Most spindles have two main features, a shaft and a whorl. Although not all spindles possess a distinct whorl. Compare the two supported spindles in the photos above. The Navajo spindle has a very distinct, large whorl upon which to build up the cop of yarn. The smaller supported spindle, (designed to be spun with a small bowl supporting its base) does not show a defined whorl but it is clear where the cop should be built up. In her work on The Evolution of Spinning, Heather McCloy talks about another type of spindle called the cross arm spindle. This type of spindle consists of a piece of wood or bone attached to the bottom of suspended type spindle instead of a rounded whorl. "These types of spindles were used exclusively as drop spindles, either twisted by hand or rolled along the thigh to start the rotation while the yarn is pulled out from the fibers. Eventually the cross-arm style was expanded upon to create a double cross-arm spindle, commonly known today as a “Turkish” dropspindle. This style was used across the Middle East, and is formed by two arms that interlock (often at right angles) at the bottom of the spindle to allow for more balanced spinning than the single-arm style. Some sets come with two sets of arms, so that you can use one set for thinner yarns and the second set for thicker yarns, and others come with arms of two different weights, allowing you three possible weight combinations for spinning on the spindle." Turkish Spindle with yarn woven onto the cross arms. In a previous section we looked at different types of whorls and if you recall they were made from stone, bone, wood, and shell. Undoubtedly the materials could tell us great things about trade routes and cultural status in a community. Whorls play a part in a number of mythological stories. The Greek Goddess Anake was the Goddess of Fate until the Fates were born. She was the mate of Chronos and like Chronos, she was incorporeal and serpentine like. She was not a spinning Goddess but Plato had a vision of her spinning the universe. He said the sun, moon and planets were her spinning whorls. Plato said Sirens sang through the webs of fate she wove and souls endlessly moved through the strands on their way to and from death and rebirth. In Plato's The Spindle of Necessity, the cosmos is represented by a spindle with a giant whorl attended by sirens and The Fates, whose duty is to keep the rims of the spindle revolving. The Fates, Sirens, and Spindle are used in Plato's The Republic, partly to help explain how known celestial bodies revolved around the Earth according to his cosmology. Plato's Ptolemaic System map. The descriptions of the rims accurately fit the relative distance and revolution speed of the respective bodies as would appear to an observer from Earth. In the Norse legends, the two elder Norns are said to set happy fortunes for people, while Skuld, the youngest, often changed their decrees to more tragic outcomes. Skuld determined the length of the thread of life and in some cases, she tore apart that which her sister's had already woven. As they were linked to time, each sister represented a different age. Urd was the crone, old, decrepit and very absorbed in the past. Verdandi, the middle sister, was active and fearless. She was always looking straight ahead. Skuld, the youngest, represented an uncertain future and was prone to violence and destruction. In our next lesson we'll look at the spinning wheel. Turmeric is a wonderful spice that has a million uses including being a great natural dye. It also happens to be something that most folks have in their kitchen right now. This post is a project in using plant dyes. I'll give you all the steps to try on your own. You can try dying with fruits and some vegetables like red cabbage but keep in mind they are rarely color fast. I learned this the hard way the first time I dyed with foodstuffs. I tried beets (it's damn near impossible to get that stain our of your clothing when it happens on accident right)? Well, the beautiful color did not remain in my wool yarn or fabric for very long. It lightened each time I washed it and eventually became a muddied, unattractive color. So just be prepared if that's the route you want to try. For this project I recommend using a fiber you feel excited about. That might be a skein of undyed wool, this is a great brand, or a pillowcase, or sheet or article of clothing. Just understand if they are not natural fabrics the dyes will likely not set. Cotton will take dye or not differently from wool. Feel free to experiment with this and have fun. big pot to dye in (if you have a rusty enamel pot you can just use water and skip the vinegar, the rust will act as the mordant but will change the color results) DO NOT USE ALUMINUM, it will cause all sorts of problems with your dye. Stainless is fine, enameled pots are even better. Gather up your fiber/fabric and place it in a large pot of hot (from the tap) water with a tiny bit of dish washing detergent. Submerge the fiber and be sure to get it completely wetted down. Let this sit for at least an hour (you can also do this overnight). Rinse your fiber under cold running water until all the soap seems to be out. Fill a big pot with four cups of white vinegar (or enough to fully submerge your fiber/fabric). Let this sit for a minimum of one hour. Overnight is fine. Fill a big pot with 12 cups of water (or enough to fully submerge the fiber/fabric), and 1/4 cup of turmeric. Mix it well and begin to heat on the stove. Bring the temperature up to around 140 degrees for cotton (because there is no worry about felting) and 120 degrees for wool. You do not want to allow the water to boil. High heat + agitation = felted wool. Submerge your fiber and then just leave it be. You can leave it in the dye pot for an hour or less or more. Totally up to you. Gently lift the fiber/fabric from the dye pot and let water drain away to see if you like the color, if not, put it back in for longer. Fabric in the dye pot with Turmeric. Photo Credit Remodelista. When you've achieved the color you want, remove the dyed fiber/fabric from the pot and put in a colander and rinse under cool running water till the water runs clear. Find a place out of direct light to let your piece dry. It might take a day or so. I like to hang my fibers to dry to increase air flow but others like to lay them in drying racks. Up to you. Turmeric dyed fabric. Photo credit: Vagabond's daughter. You can try all of this with food coloring or powdered dyes (also known as acid dyes for their need of vinegar to make them set). Some folks even dye with KoolAid. A great brand I use is Jacquard. They produce beautiful colors. If you'd like to try other plant based dyes you'll need to have a good mordant on hand. Vinegar works okay but it's best to use either alum, iron (like a rusty nail or rusty pot), tin, etc. There's a GREAT article here with lots of info just on mordants and how to use them safely and effectively. Each mordant will produce a different color with the same dye stuff. My go to is always alum salts. I keep a stash on hand for dyeing. They are NOT EDIBLE so mine hide away in a safe place and are clearly labeled. So give it a try and please post a picture or some comments on your results in the Facebook group. I'd love to see what you came up with! Portions of this post originally appeared as a guest blog post on Crochet Addict UK. We've learned that ancient people's were processing fibers and spinning and weaving them into everything from clothing to funeral cloths. The archaeological record shows us that they used the natural colors of these fibers as well as a whole collection of beautiful dyes they made from our plant allies. Beautiful, natural dyes are all around us. Just take a walk in your back yard or local park and you’ll find lots of plants which you can use to safely dye fabrics and fibers. A simple google search will give you a number of lists of familiar plants you can use for dyeing such as: Avocado pit, Bloodroot, Black Eyed Susan, California Poppy, Coreopsis, Calendula, Dahlia, Dandelion, Goldenrod, Heather, Hollyhock, Indigo, Lavender, Marigold, Purple Basil, Russian Sage, Safflower, Sunflower, Tansy, Walnut, Weld, Yarrow and Zinnia to name a few. Roots, seeds, flower, leaves, and/or stems are used depending on the plant. The same plants can yield different colors depending on the type of material being dyed (whether the material is a cellulose fiber like cotton, or a protein fiber like wool or silk), and the type of mordant used to prepare the material. A mordant is an inorganic substance, generally an oxide, that combines with a dye to fix it to the fabric or fiber. I usually use Alum salts but you can even use a rusty nail or a dye kettle with some rust on it. The type of mordant has an affect on how the color turns out. Why dye with natural dyes? The colors are more alive. They glow in ways that pictures cannot do justice. They have beautiful natural variations and are not flat but multidimensional. Dyeing with natural dyes is a great way to get back in touch with nature and for me, it feels wonderful doing something with so much deep history. I especially like when I can use plants native to my area. The plants I have learned to use for dyeing are: Lavender, Geranium, Calendula, Dahlia, Madder, Weld, Alkanet and Indigo. The first four I get from my own garden and that list is expanding every time I dye, (and every gardening season). The other plants I purchase in powdered or root form. Plants do not always yield the color you might expect and ironically, green is the hardest color to get from plants. Calendula and Weld both yield a bright sunny yellow with an alum mordant. 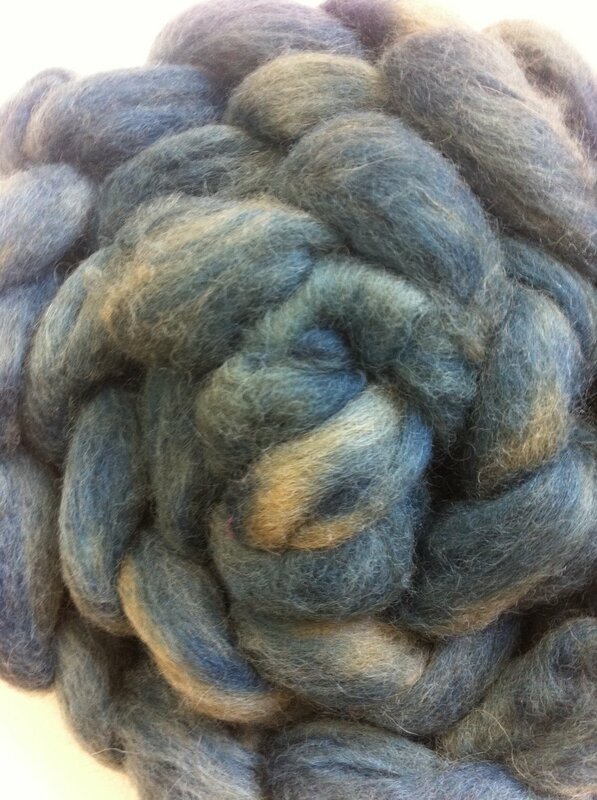 I have also top dyed this beautiful color with indigo to get a fabulous yarn with greens, blues, and purples. One of my dye cards with Madder, Weld, Fustic, Marigolds and Quebracho Red. Madder and Geranium have given me very pretty reds and pink and orange hues. Alkanet, a plant related to Borage, yields beautiful purples as you can see here. Marshfield School of Weaving, In Pursuit of Purple: Learning from Alkanet, November 2010. Roving I dyed with Alkanet, drying in my yard. Indigo dyeing can be a trying chemical process but I’ve discovered instant indigo crystals which are super easy to use and make dyeing with indigo fun. I’ve had success dyeing directly onto mordanted fibers and top dyeing, dipping pre-dyed fibers into the vat for a blend of color as shown in the multi-colored yarn previously. Based on murals such as the ones below, we can interpret what colors people were wearing even if we don't have the physical evidence. This mural is from the Mayan site of Bonampak in Central America. Mural at Bonampak, Chiapas, Mexico. In our next post, we'll dive right into our own project experimenting with natural dyes. To learn more about plant based dyes there are some fabulous resources out there. Check out Wild Color by Jenny Dean, Harvesting Color by Rebecca Burgess, The Handbook of Natural Plant Dyes by Sasha Duerr, A Weaver’s Garden by Rita Buchanan, and The Modern Natural Dyer by Kristine Vejar to name just a few. In Chinese traditions The Jade Emperor has a daughter called Zhi Nu (weaver girl). She is The Goddess Weaver who is responsible for weaving not only the colorful clouds of the heavens but also the silver river in the sky (The Milky Way). As one version of the myth goes, The Weaver Goddess, on earth as Zhi Nu, fell in love with a cowherd Nihulang. Their love was forbidden and Zhi Nu's father, the Jade Emperor, banished them to opposite sides of the Silver River (the Milky Way). Once a year, on the 7th day of the 7th lunar month, a flock of magpies would form a bridge to reunite the lovers for one day. (Brown and Brown, 2006, 72). This is a major celebration day in China known as the Qiqiao Festival. It is sometimes called Chinese Valentine's Day. Grandmother Spider Woman is the creatrix in Native Southwest American cultures. She taught the people to spin thread and weave cloth. The Hopi believe she wove the earth and the heavens from one continuous thread. The Navajo have a creation story of the first people having to travel up through four lower worlds. Each world was full of chaos and destruction. In one world, Grandmother Spider Woman weaves a strong web to help them escape before a giant flood washes them away. Shaman Spider Woman by Susan Seddon Boulet, 1986. Near Tó Ałnáosdlį́į́, Crossing of the Waters, lived Spider Man and Spider Woman. They knew how to weave the fibers of cotton and hemp and other plants. First Woman asked Spider Man and Spider Woman to teach people how to weave the fibers of plants so they would not have to depend on animal skins for clothing. Cotton seeds were planted, and the cotton was gathered. Spider Man taught the people to shape a little wheel, 3 or 4 inches in diameter, and put a slender stick through it to spin the cotton. First Woman said, "You must spin towards your person, not away, as you wish to have the beautiful goods come to you. If you spin away from you, the goods will depart from you." Spider Man named the spindle "yódí yił yaʼhote", meaning "turning around with the beautiful goods." Spider Woman said, "No, it shall be called nto is yił yaʼhote, turning with the mixed chips." After they had spun the thread they rolled it into good-sized balls, and brought straight poles and tied them to make a rectangular frame. Spider Man wound the thread on two of the poles from east to west, over and under the poles. Then Spider Man said that the ball of thread should be called "yódí yił nasmas aghaaʼ," meaning "rolling with the beautiful goods." Spider Woman said, "No, it shall be called ntsilí yił nasmas aghaaʼ." After the loom was finished the cross poles were erected and other poles placed on the ground to hold the loom frame solidly, and the loom was stretched into place. Spider Man said, "It shall be called yótí ilth na daiʼdi, raising with the beautiful goods." Spider Woman said, "No, it shall be called niltłʼiz na daiʼdi, raising with the mixed chips." There was a notched stick running across, with a notch holding every other thread. Spider Man said, "It will be called yódí bił nesłon, looping with the beautiful goods." Spider Woman said, "No, it shall be called niltłʼliz bił nesłon." Then they used a narrow stick about two and a half feet long, and wound the yarn or thread over it, and where there is no design they ran it along. That was given the same name as the ball of thread. They used the wide flat stick for tapping down the thread. Spider Man said, "It shall be called yódí naʼygolte;" but Spider Woman said, "It shall be called niltłʼiz naʼygolte." Spider Man then said, "Now you know all that I have named for you. It is yours to work with and to use following your own wishes. But from now on when a baby girl is born to your tribe you shall go and find a spider web woven at the mouth of some hole; you must take it and rub it on the baby's hand and arm. Thus, when she grows up she will weave, and her fingers and arms will not tire from the weaving." Versions of Grandmother Spider Woman exist among the Aztec as well and other cultures in Mesoamerica. In the Hopi Snake Myth, recorded around 1900 A.D. a young man journeys to the home of the Snake People. There, he meets the beautiful Snake Maiden. On the walls of the kiva were hanging many costumes made of snake skins. Soon the chief said to the people: "Let us dress up now," and turning to the young man bid him to turn away so that he would not see what was going on. He did so, and when he looked back again the men had all dressed up in the snake costumes and had turned into snakes, large and small, bull snakes, racers, and rattle-snakes, that were moving about on the floor hissing, rattling, etc. Spider Woman whispered to the young man, that the one that acted so very angrily was the pretty maiden and that he should try to take that one. He tried, but the snake was very wild and fierce. "Be not afraid," Spider Woman whispered.... He at once grabbed it, held and stroked it four times upward, each time spurting a little medicine on it, and thus freeing it from its anger. The snake transforms back into a maiden. The pair later marry and their children become the ancestors of the snake clan. But Grandmother Spider Woman goes even further back in time than the Hopi, Navajo and other southwestern tribes. She goes back to the Aztec, and even to the Olmec. She is very ancient in the mythologies of these cultures as weaver of the universe. What are your thoughts on these two goddesses? Saule is a Baltic solar goddess. She is one of the most powerful Baltic deities and rules over home and hearth, life and fertility, and warmth and wellness. Saule spins the sun beams. She rides on her chariot during the day spreading those spun sun beams and at night she sails in her boat on the world sea. She is depicted as having golden spun hair with golden silk robes and a golden crown. She is also represented by a wheel or rosette. Look how her skirt seems to be knit with stockinette stitch in the painting above. Amber artifacts have been unearthed in nearly 60 different locations in Lithuania and span the time from between the early Stone Age to the Iron Age. Idol of the Sun used for peasant rituals in the 19th century. Photo credit Wikipedia. Saule, the sun (female) and Menuo, the moon (male) were wife and husband. Did you already know about the Baltic region's pantheon of gods and goddesses? What do you think of the sun being female and the moon being male in this tradition? What do you think about the connection between amber and spinning? If you have a stone you feel connects to your fiber art what is it? Mokosh is a Slavic goddess who is the protectress of women's work and destiny. She is the goddess of women, water, earth, fertility and home. She acts as a guardian and teacher for weaving, spinning, shearing of sheep and women in childbirth. She was important enough to be the only female deity to have a sculpture made and erected by Vladmir the Great. Modern wooden statue of Mokosh in the Czech Republic. “Mokos is most likely a later and more strongly personified variant of the Slavs’ elder earth Goddess, “Damp Mother Earth,” and the word Mokosh does translate to "wet". (John McCannon, Encyclopedia Mythica). Mokosh had many attributes and duties as already mentioned. She was also meant to protect the sheep and the their fleeces. Women would make offerings of scissors or shears and a skein of wool to the base of her effigies. In embroidered artifacts, she is depicted as standing between two horses, her arms raised into the air. The reproduction of the designs on a border of a Russian wedding towel (the end of the 19th century). This specimen is housed in the Sergiev Posad State Historical-Artistic Museum-Reserve (Sergiev Posad, Russia). Sergei V. Rjabchikov, Krasnodar, Russia "On Scythian, Sarmatian and Meotian Records about Thunderstorms"
Habetrot is a goddess worshipped by the border groups in Northern England and Lowland Scotland. 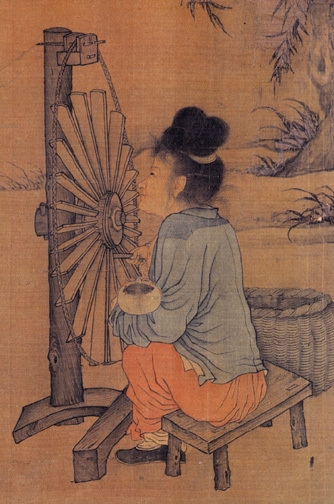 She is connected to both spinning and the spinning wheel. One well known tale of Habetrot was recorded by William Henderson in 1866. Habetrot is depicted as having long, loose lips. Click here for a version of how she came to look this way. What did you think of that story? Upon reading it I am struck by how it actually makes spinning a bad thing for a girl to do if she wants a husband. I'm fascinated how this could be a useful myth to pass on to your daughters. Brigit, Brigid or Brighid, meaning exhaulted one, is the daughter of the Dagda and one of theTuatha Dé Danann in the Celtic tradition. Brigid is the patroness of poetry, smithing, medicine, arts and crafts, particularly spinning and weaving, cattle and other livestock, including sheep, sacred wells, serpents (in Scotland). In modern traditions, whether she is seen as a saint or a goddess, she is linked closely to hearth and home. Spring is her season and she is linked to lambing. Imbolc in Pagan traditions is her special Sabbat. She is a triple goddess. She appears as the maiden, the mother and the crone. Brigid as Maiden, Mother and Crone, creator of the steppe land. In the Celtic tradition, spinning wheels were made from Rowan wood as the Rowan tree was the sacred tree of the Goddess Brigid. It is said that everywhere she walked, flowers appeared under her feet. Brigid's cross is a cross woven of reeds and is a symbol of the coming of the sun as winter is usurped by spring. If you'd like to give Brigid's cross a try, here's a great page with directions. Have you ever made a Brigid's cross? In the Egyptian pantheon, the Goddess Isis was worshipped as the ideal mother, the protectress, the patroness of magic and nature. She was considered the perfect example of a loving wife and mother and was considered deeply magical. Her name means "Throne" and thus her headdress actually depicts a throne. She is the first daughter of Geb, the God of the Earth and Nut the Goddess of the Sky (and night). Artist: Ägyptischer Maler um 1360 v. Chr. Isis and her sister Nephthys were called the Abuti, the two weavers. They wove both funerary clothand magic. One myth holds that Isis wove the mummy wrappings for Osiris, her brother and husband, after Nephthys spun the threads. The funerary wrappings of the dead were woven with magic to help both seal the dead in their "egg" and help them be reborn in the next life. The cult of Isis was known for their crisp white, linen shifts said to have been woven by Isis and imbued with her magic. Horus was Isis' son by Osiris and many depictions of Isis show her nursing the young pharaoh. Tayet's cloth acted as: funerary cloth delivering the dead to the next life, a protective shield between the living and the dead, and a tangible barrier between both worlds which the living could connect with. The most interesting thing about weaving and fiber work in ancient Egypt is that it was not strictly women who did so. Men shared equally in the skill and thus fiber arts were not looked upon as a lower class occupation or skill. Instead fiber artists were more esteemed members of society. Given that, the records do not indicate there were any gods of weaving or spinning in ancient Egypt, only goddesses. In the Shinto religion Amaterasu is the Sun Goddess. She's the creatrix of the universe. Her name means "shining in heaven". She created the universe, the gods and all the clothes they wear. She gave humans two skills which are highly prized: the art of weaving hemp and silk. The Emperor of Japan is considered to be a direct descendant of Amaterasu. The oldest stories about her go back to the earliest written records in Japan, around 680 A.D. It is written that Amaterasu painted, with her siblings, the landscape of Japan. Artist: Utagawa Toyokuni III,Kunisada Japanese Sun goddess Amaterasu emerging from a Cave,"ORIGIN OF IWATO KAGURA DANCE"
Festivals around Japan celebrate her and weaving every year. Poems and songs celebrating and honoring weaving are written and new cloth is given to the temples. In the next set of posts, we will move into dyeing with plants. I'll provide you with some basic info and plenty of resources for learning more if you are interested. There will be links to some videos as well. I will also be providing a dyeing project. If you'd like to dye some wool yarn, feel free to pick up a cheap skein of undyed wool, Fisherman's Wool from Lionbrand is very inexpensive and takes plant as well as acid dyes very well. You can find them at pretty much any craft store which carries yarn, like JoAnn. In German lore, Holda was the protectress of women and women's crafts. She is likely equated with the Scandinavian goddess Hulda. She is also equated with Frigg, Odin's wife as we learned previously, and "the Mistress of the Wild Hunt" in Norse mythology. Of all female crafts, Holda was most protective of spinning. She is said to have taught women how to cultivate, harvest, and spin flax into linen. Holda inspires and rewards the hard worker and punishes the lazy and messy worker. Indeed she is best known from the Grimm fairy tale in which she praises her industrious daughter (as the loving mother) as the girl sits at her spinning wheel and bloodies her finger as she spins, but rails against her "lazy" daughter as the old crone. She is honored during the 12 days of Christmas and there are prohibitions against spinning during this time. In Swabia, in Southeastern Germany, all spinning must be finished on Christmas Eve and no new work can begin until Twelfth Night. In the Horselberg region, the opposite is true. Flax is loaded onto distaffs on Christmas Eve. Holda makes her rounds promising as many good years as there are threads spun by Epiphany. In some traditions, Holda is like Santa Clause, she delivers gifts to children on Christmas Eve and determines who is naughty and who is nice. Holda is a goddess associated with winter and all the crafting that takes place indoors during that time. When it snows, it is said she is fluffing her feather pillows. She is described as both the maiden, with a mantle of white (often resembling snow) and as the crone, with crooked, decaying teeth. "Holda's connection to the spirit world through the magic of spinning and weaving has associated her with witchcraft in Catholic German folklore. She was considered to ride with witches on distaffs, which closely resemble the brooms that witches are thought to ride." (From the Canon Episcopi, quoted in Ginzburg, Carlo(1990). Ecstasies: Deciphering the witches' sabbath. London: Hutchinson Radius. p. 94. ISBN 0-09-174024-). Image from wikipedia. No citation included. According to scholars, Perchta is likely Holda's southern counterpart in Germany. They both share the role of Guardian of the Beasts (or hunt). They both appear and are honored during the twelve days of Christmas, or during winter in general. They both rule over spinning. Finally, they both appear in two forms, the maiden and the crone. Jacob Grimm says that Perchta appears, "precisely in those Upper German regions whereHolda leaves off, in Swabia, in Alsace, in Switzerland, in Bavariaand Austria. "(Grimm, 1835:13:6) InBavaria and German Bohemia, Perchta was often represented by St. Lucia. In some older descriptions of Perchta, she is described as having one overly large, swan-maiden foot. This foot links her to other high goddesses like The Valkyrie (in their Swan-Maiden forms), and it is this foot which allows her to treadle the spinning wheel more effectively. Had you heard of this Mother Christmas legend? Do you recognize the Grimm fairy tale these goddesses are associated with? Which one is it? In the next post, we'll learn about the Celtic Goddess Brigid. Frigg, sometimes called Frigga, is Odin’s wife in the Norse Pantheon of gods and goddesses. She is the queen of Asgaard and other than Odin, the only one permitted to sit on his high seat and look out over the Universe. She is a goddess associated with married women and was called on by women to assist in childbirth. She is the patroness of spinners and weavers and is said to weave the clouds in the sky. Originally the Valkyries were believed to be angels of death, dark, frightening creatures who flew over battlefields snatching up the dead as Odin demanded to take them off to Valhalla. Valhalla was the heaven of Odin’s ghost army. The only way it to Valhalla was to die in battle or in an honorable way. In this early incarnation the Valkyries were likened to giant crows or ravens. Some time between the 3rd and 11th centuries, they became less horrific and were romanticized as Odin’s shield maidens who came down to the battlefield with flowing blonde hair and snowy, lithe arms to carry the honored dead off to the great hall of Valhalla where they serve them mead. In this incarnation they were likened to swans and were at risk of being trapped on Earth if they were caught in their human form (without their plumage). Some scholars relate the Valkyrie to the Fates, or to the Celtic goddess The Morrigan. They are called the weavers of fate and it is said a warrior may dream of a Valkyrie the night before a battle in which he will die. One story tells of a warrior who dreamt of a Valkyrie weaving a cloth of men’s entrails and weighted down by severed heads. He interpreted this to mean he was marked for death. 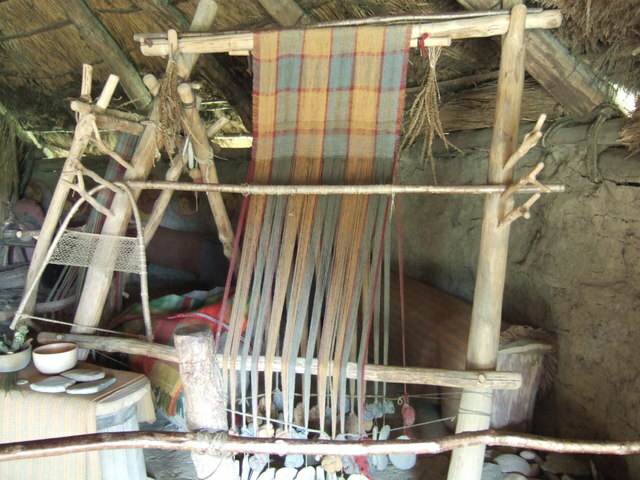 Iron Age Loom. Image from Castell Henllys. Which do you identify the most with Frigg or The Valkyrie? In the next installment we'll learn about Holda and Perchta, two goddesses in the Germanic tradition. The Goddess Neith in the tomb of Nefertiti. Neith was the Egyptian goddess of war and hunting. Two arrows crossed over a shield were her symbols. She also wore and ankh on her waist. Because her name also means water she is considered a mother goddess and creatrix of the world. Part of Neith’s hieroglyph depicts a loom, so she was also considered the goddess of weaving during a later period in Egyptian history. Thus, her role as a water creator goddess morphed into that of a deity who wove all of the world and existence into being on her loom daily. Indeed she is sometimes depicted wearing a loom shuttle on her head. She is even said to have woven the bandages for the mummified dead. We can trace her worship back as far as 7000 years ago. According to Dr. Wim van Binsbergen, "Neith never engaged in any kind of sexual union; that is, she was eternally a virgin. Yet, as the primordial Being, she was also generative. Thus, in Neith we have one of the earliest appearances of the archetype of the Virgin Mother, the Holy Parthenos, in her original, unadulterated form." Neith is our first example of one of THE most powerful goddesses in her pantheon who is associated with the fiber arts. Being the weaver of the world is no small accomplishment! The Fates, also called The Moirae, are a trio of goddesses who have the fate of men (humans) in their hands. Clotho is the spinner. She spins the threads of life. Lachesis is the measurer. She chooses one’s lot in life and measures (determines) how long it will be. 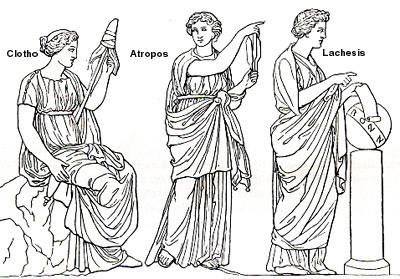 Finally, Atropos, is the goddess who cuts the thread of life at the moment of death. Her name means, “she who cannot be turned”. The Fates pre-date the Greek Pantheon. Some scholars have said The Fates determine the paths of the gods as well. But other documents list them as the three daughters of Zeus and Themis. They were often depicted as ugly, old women. Clotho holds her spindle, Lachesis had a scroll said to be her horoscope and a globe, and Atropos wields her scissors to cut the thread of life. The Romans called them The Parcae and named them Nona, Decuma and Morta respectively. Interestingly in modern Italian Nona (spelled Nonna) is the word for grandmother and Morta means death. So it’s possible these beliefs may have survived into Christian times after Rome’s fall. The Norse equivalent of The Fates would be the Norns. This group of three goddesses also ruled the destiny of gods and men. The origin of the word "norn" is though to mean "to twine" which would clearly link them to the twining of the thread of life. Next, we'll learn all about the Norse/Germanic goddesses linked to fiber. We'll get to dip into some great stuff about Frigg, The Valkyries, Holda and Perchta. What do you know about Neith and The Fates? Did you know about The Fates from the Greek or Roman pantheon? Finally, just for fun, what type of fiber do you think Neith is using to weave the world or Clotho is using to spin an individual's fate? Do you think it's animal, vegetal or mineral like gold or silver? Photo credit: the Bradshaw Foundation. Madder plants with dyed fabrics. Various dyestuffs native in my NorCal home. Roses in my neighbor's garden. Sage blooming in my garden. Funerary Textile from the Ottoman Empire. Hunting tartan, reproduction to resemble ancient tartans. The Colorwheel for inspiration in designing your own color way. One of the fibers we have the most and earliest archaeological information for is wool. Wild sheep were originally more hairy than wooly. The archaeological record indicates sheep were domesticated between 9 and 11, 000 years ago. But evidence from a few Iranian sites shows people began selecting for more "wool like" coats on sheep around 6,000 years ago. So over time, this quality was bred into the sheep. Prior to the spinning of wool to make yarn or thread, it's believed felting was the main method of wool production for fabric creation. Many cultures have myths surrounding the origins of feltmaking. Among the ancient Sumerians the discovery of felting was attributed to Urnamman, a famous Sumerian war hero. In the story of Saint Clement and Saint Christopher we are told that men fleeing persecution stuffed wool into their sandals to protect their feet. At the end of their journey, all the movement, sweat and heat created felt. The oldest archeological evidence for felting hails from Turkey. In wall paintings dated from 8500 to 5,000 year ago show evidence of felt applique. A tomb in Southern Siberia contained felted fiber found with a nomadic tribal elder dating from 7,000 years ago. The earliest evidence we have of woven wool garments dates to two to three thousand years ago (Smith M.S., Barbara; Mark Aseltine, Gerald Kennedy DVM (1997). Beginning Shepherd's Manual, Second Edition. Ames, IA: Iowa State University Press. ISBN 0-8138-2799-X.). Wooly sheep were introduced into Europe from the Near East around 6,000 years ago and the earliest known woolen fabric (dating to around 3,500 years ago) was found preserved in a Danish Bog. In this example below, only the arms and legs of the bog body were preserved but the legs were covered in a woven wool textile. Found in 1944 in Søgårds Mose in Denmark. But in order to weave wool or any other protein fiber for that matter, one must first remove it from the animal. Prior to the invention of shears, wool was literally plucked off the animals. Some folks still do this with Angora rabbits and sheep. It's a time consuming process to be sure but there are no cut ends, which lends a full staple fiber. 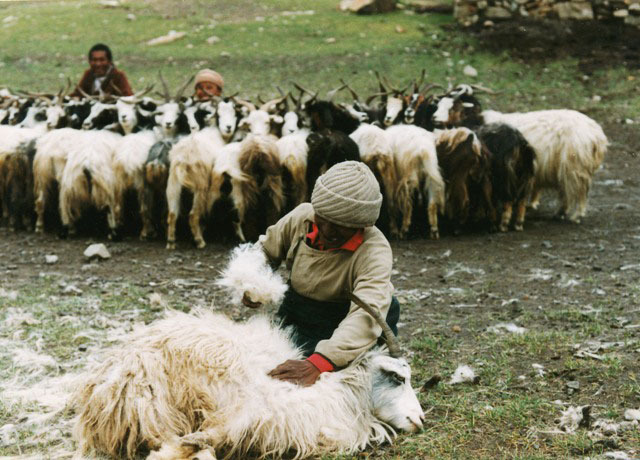 Plucking cashmere from a Changthang goat from Tibetan Archaeology Magazine. Then the fiber must be spun to create yarn or thread. The earliest spinning of fibers consisted of rolling fibers down the thigh with the hand and creating thread, yarn or cordage. There is even evidence of a string skirt from the Upper Paleolithic 20,000 years ago! Clearly this technique was happening with all kinds of fibers for a very long time. For the past 9000 years or so, spindles of some form or other have been used. Spindles and spindle whorls have been found in archaeological sites all over the world. The spindle whorls tend to preserve better as they are usually made of stone, ceramic or shell, materials more permanent than wood which usually makes up the spindle staffs. Here are a selection of spindle whorls from sites around the world. Spindles were used for thousands of years for fiber production and are still used today for craft production of fiber. Distaffs, which held unspun fibers in preparation for spinning, are not much used today but we have plenty of evidence of their past uses. Reverse of a tetradrachm struck at Ilion, cult statue of Athena wearing a chiton with overfold and kalathos; in her left hand, a distaff or spindle, in her right hand a spear resting on her shoulder, 2nd c. BC. 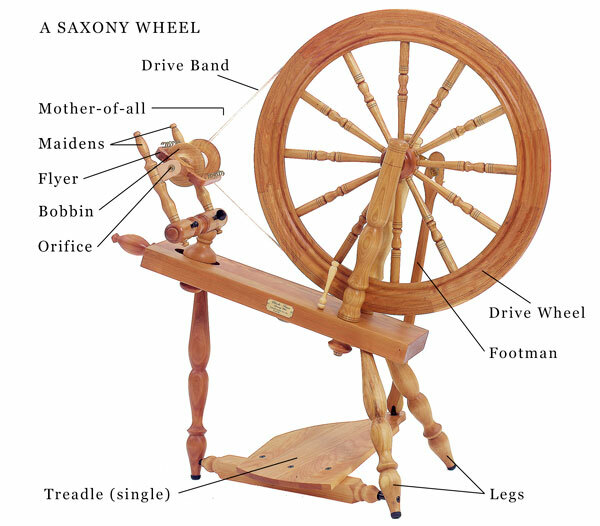 Spinning wheels appeared in Asia in the 11th century and gradually replaced spindles and distaffs for spinning greater quantities of fiber much quicker. By the Industrial Revolution, new machines such as the Spinning Jenny and the Spinning Frame displaced the wheel. The earliest clear depictions of the spinning wheel come from Baghdad and China. From there its use spread throughout the Old World. Once spun, the next logical step was weaving. Humans have and continue to weave, all kinds of materials for all kinds of purposes. Woven thatch makes a great roof for a structure, woven reeds make great baskets and can even be made waterproof. But it is woven fibers made for clothing which we are really interested in here. So we see from all these dates and all this evidence that fiber work really reaches all the way back to our origins as a species. Is it any wonder that it factors so completely into the mythologies human cultures created? In our next lesson, we'll look at color. The origins of dyes and the beginnings of colorwork. We'll also learn about the arrival of knitting on the scene of fiber work and art. To begin to answer the origins question let's talk about textiles in general. The wearing of clothing is a uniquely human practice. Not even other primate species use textiles or even animal hides. Humans are remarkably hairless unlike other mammals and our needs to both keep our skin safe from the elements and injury drove us to begin clothing ourselves. As an aside, there is an interesting study looking at the human body louse as being the reason we started clothing ourselves. That in combination with migrating our of equatorial Africa into more temperate and later, colder climes. See Travis, John. "The Naked Truth? Lice hint at a recent origin of clothing". Archived from the original on 4 March 2007. Retrieved 15 April 2007, for the full story. EST. 10,500 TO 11,000 YEARS BEFORE PRESENT COPYRIGHT AUGUST 31, 2012 PETER A. BOSTROM Cast of a bone needle from the Buhl site. The archaeological record tells us that people were making finely turned bone needles and wooden awls as early as 40,000 years ago. The earliest definitive proof of the use of needles comes from the Solutrean culture, which existed in France from 21,000 to 17,000 years ago. We can extrapolate a bit and imagine these fine tools were being used to manipulate animal skins. Animal sinew worked very well as a sort of thread to bind hides together. We also see evidence in the record of embroidery with shells and bone beads. Here is a rendering of a burial of a boy and girl buried in Sunghir, Russia around 28,000 years ago. Am J Phys Anthropol. 2004 Jul;124(3):189-98. These two children were thought to be wearing furs and skins but they were elaborately embroidered. Clearly there was an appreciation of not just covering the body, but decorating ourselves with this clothing. Even more exciting, we know from the archaeological record that people were weaving vegetal fibers this early as well. Even in places like the Southeast US, people were using vegetal fibers for decoration on pottery and for use as fishing nets, weirs, baskets and more. Fiber, whether vegetal or animal, does not preserve very well so most of our evidence of this is from more permanent artifacts like pottery. Some archaeologists have perfected the techniques of this type of work and reproduce it to act as a sample and study guide. Making cord marked pottery with a paddle. From the Texas Beyond History website. Here we see a modern example of how cord marked pottery was made. A flat stick is wrapped with spun/twisted fiber and with one hand inside an unfired clay pot against the pot wall, the other hand slaps the stick flat side against the outer wall. The pattern is then created and the pot is then fired, sealing the pattern with the heat. The earliest example from the archaeological record of such use of vegetal fibers is 27,000 years old and comes from Dolni Vestonice in the Czech Republic. But they weren't just using vegetal fibers for making pots and utilitarian items, they were also dying them! At Dzudzuana Cave in the modern day Republic of Georgia, archaeologists made an incredible find. "In 2009, researchers (Kvavadze et al.) reported the discovery of flax (Linum usitatissimum) fibers in all levels of the Upper Paleolithic occupations, with a peak in level C. A few of the fibers in each of the levels were colored in hues of turquoise, pink and black to gray. One of the threads was twisted, and several were spun. The ends of the fibers show evidence of being purposely cut. Kvavadze and colleagues surmise that this represents the production of colorful textiles for some purpose, perhaps clothing. Other elements that may be related to the production of clothing discovered at the site include fur hair and the micro-remains of skin beetles and moths." 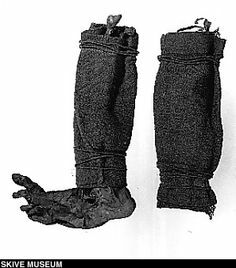 Photo of the sprang stocking, or sleeve, from Tegle, Norway. It also has a tablet-woven border. Dated 3-5th c. in "Prehistoric Textiles" by E.J.W. Barber. That means we have evidence of dyed fibers as early as 36,000 years ago! Prehistoric textile experts suggest that the earliest textile (not just skins sewn together) was probably felt. Based on surviving samples (from the Middle East, parts of China and India due to arid conditions), we know early clothing was made of full loom widths which were draped over the body and then pinned or tied down. We see evidence of this in many pieces of art from this period. At the Neolithic site of Çatalhöyük in Anatolia, archaeological evidence reveals textiles were used to wrap the dead and have been carbon dated to 8,000 years ago (Jenkins, pp. 39–47). "Evidence exists of flax cultivation from c. 8000 BC in the Near East, but the breeding of sheep with a wooly fleece rather than hair occurs much later, c. 3000 BC. " (Jenkins, pp. 39-47). In the Indus Valley, people used spun cotton for clothing as early as 7,000 years ago. There is a story of cotton called the Vegetable Lamb. When Sir John Mandeville returned from India to the court of Edward III, he spoke of a wonderful tree that bore tiny lambs on the ends of its branches. Stories of these “vegetable lambs” spread throughout England. But in 1641, Kircher of Avignon examined cotton and determined it was actually a plant and not an animal. But cotton has been spun, woven and dyed for many uses since prehistoric times in India, Egypt and China. Many hundreds of years prior to Mandeville’s “vegetable lamb” story, cotton textiles of incredible quality were woven in India and this skill spread to the Mediterranean countries. Arab traders traded fine muslin and calico fabrics to Italy and Spain in the 1st century A.D. Cotton cultivation was introduced to Spain by the Moors in the 9th century and by the 14th century cotton and linen were both being produced in Venice and Milan. Very little cotton was imported to England before the 15th century; thus Mandeville’s confusion. But by the 17th century, the East India Company was bringing rare fabrics to court from India. In the New World, Native Americans skillfully spun and wove cotton to create beautiful garments and tapestries. There are even fragments of cotton fabrics found in pre-Incan tombs in the Peruvian Andes. The image below is an example of a Byzantine tapestry from the 5th century. Metallic fibers such as gold and silver were generally core spun around a cotton or silk core, sometimes intentionally letting the color of the core show through. Then these fibers were woven into the fabric itself. Generally reserved for royalty or very wealthy elites, we have evidence of this Cloth of Gold which was woven on Byzantine looms from the 7th to 9th centuries. There is also archaeological evidence of this type of spinning and weaving of metallic fibers in the 12th century during Genghis Khan's rule. So you see, the use of fibers, whatever their origin, goes back a long ways. In Part 2 we'll learn about the beginnings of animal fiber production and see how it went from using matted fur and hair to make felted garments, to actually spinning and weaving and knitting these fibers to make strong, durable textiles. Coming up on Friday, Origins Part 2! This description of the mortal woman Arachne depicts a skilled artist, but one with much hubris. Boasting of her abilities, Arachne claimed she could out­weave Athena easily. Many cautioned her to guard her tongue lest she offend the goddess. Arachne was unmoved and said she’d face any punishment if she lost the contest. Athena appeared to her in the guise of an old woman and tried to counsel Arachne against the challenge. Again, Arachne refused and Athena then revealed herself in her true form. The contest was on. Arachne and Athena both wove with beauty and grace but Athena was quicker and more delicate. Athena wove a beautiful scene of her battle with Poseidon. She depicted 12 gods including Zeus, Poseidon and herself. Arachne wove a scene depicting what she viewed as the failures of the gods. Athena was so offended by this depiction she rent the tapestry in two with her shuttle, then touched Arachne on the head to force her to feel shame and remorse. Arachne, so filled with pain, wove a thread and hung herself from a nearby beam. Athena, then feeling sympathy, laid her hands on Arachne and said, “Arise and Live. Henceforth all of your children shall be weavers”. Arachne’s body began to transform. Her head became small, her fingers clung to the sides of her body and became eight limbs, and she released silk from her abdomen. This is how the spider was created. It's all fairly horrific if you think about it! But definitely a tale of hubris leading to the ultimate punishment. Would you have been as bold as Arachne to challenge Athena? Comment here or in the Facebook group. Wednesday I'll post the first of two lessons on The Evolution of Human Use of Fiber. Feel free to comment here on each post or probably even better, to talk together in our classroom Facebook Group, The Eternal Thread. If you have not received an invitation to this private group yet please let me know. I'm looking forward to sharing my research with you and learning from you as well. Each of you has something wonderful to bring to the table and I'm always excited to learn new things.